Normally, I shy6 away from Google applications for this project simply because it's a bit like shooting fish in a barrel. But A Google A Day, is an interesting concept Google has come up with. Every day they ask a different question that you can use their search engine (or any other) to research. When you think you have an answer, you can submit it. If you're wrong you can continue to guess, if you're right they will show you how they came up with the answer (AKA what keywords the searched). If you eventually give up you can still see the answer. It's a great safe way to teach students how to conduct effective research on the web. Ever want to share a file in 140 characters or less? TwitDoc allows you to do just that. TwitDoc is a Twitter and Scribd Mashup. Once you authorize TwitDoc to work with your Twitter account, you simply upload the file you want to share. TwitDoc then turns your file into a Scribd document, shortens the URL link to the file and allows you the 97 characters remaining to describe your file and share with your followers and the world. Simple, huh? Tonight's post I'm actually pretty excited about. For years now it's been possible to tag photos in facebook and MySpace. More recently Flickr has joined the tagging fray. But until now it has been difficult at best to tag photos within blog posts. Today, I found out about Thinglink. This site provides code you can add to Blogger, WordPress, Tumblr and Other Platforms. Besides being able to tag people, think about the other possibilitiesThinglink provides. Maybe you tag a drawing of Jamestown with various bits of information for your history class or add notes to a diagram of a frog so your students know what to look for during a biology class dissection (there are still schools that do that right?) Best of all if someone shares the image using the embed code provided with the image on your site, your tags go with it. 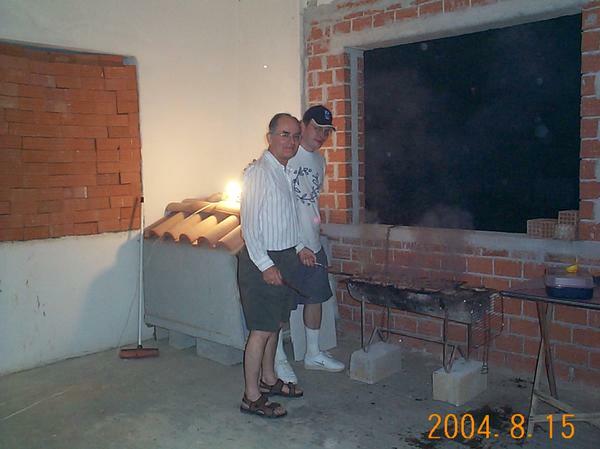 Take a look at the example I placed here of myself and Jim Bazianos grilling Greek Style in Athens during the 2004 Summer Olympics. When you design a website, it is often important to get feedback before it goes live. Perhaps your looking for a simple way to create a portfolio of your designs without the actual site being live? Recurse allows you to do both by creating examples of web pages as flat images. Recurse allows for clients to add feedback before your site goes live. But, I can imagine it also would be a good way to get peer assessment as well. Give recurse a try and let me know what you think. We talk about digital natives a lot. I'm not a huge fan of the term particularly since we are truly now close to 40 years of individuals who have grown up with technology. But, I think the real difference with this generation of digital learners is that they have more resource at hand to become content creators. Unfortunately, they don;t always have a safe outlet for that content. YouTube and Facebook tend to expose young people to a world full of harsh cynics and critics. KidsTube appears to be a safe alternative. While not surprisingly many of the clips on KidsTube are related to video games there is also a growing Educational section (currently with 780 videos). Most of the videos uploaded to KidsTube are by kids for kids and it appears to be a safe alternative to YouTube which is also blocked in most schools. I also like the rules they lay out. Certainly worth a look. I missed a post last night due to working an 18 hour day. So, tomorrow will be the double post to make up for it. But tonight is Friday Fun Night once again and what isn't fun about Dr. Suess? Many of us have grown up on the Dr. Suess Franchise, have seen the cartoons, watched the movies and even riden the rides at Universal. Now Random House brings us Suessville. Filled with reviews and a search engine for book of course, but there are also games and interactive as well as printable activities and online games. There are also history's of your favorite characters. Suessville also has sections for Parents and Educators (including some pretty amazing projects and lesson plans). It's easy to get lost for hours with The Cat in the Hat, Thing 1 and 2 or my personal favorite the Lorax and learn a lot along the way. "There are some pretty interesting features and I haven't fully explored the possibilities with MultiURL , but I'm sensing that they are plentiful. As you can see Tynt not only does provide a back link but also allows you to include a Creative Commons license. (thus protecting your work). Tynt has many other tools as well. but those may be saved for a future post once I have had more time to explore. Today, I was privileged to drop in on a Google Camp and witness some of the great ideas that were blossoming. One question did arise concerning Google Sites: "How do we include comments on a Site page?" Good question! Within sites there is a section for comments on a page. But, only those with edit rights are able to leave comments (somewhat confusing, eh?) So, I did a little research and came across an online application called htmlcommentbox. This tool allows you to add a customized comment box to ANY page on the web (provided, you can embed code on the page) including Sites (provided you use the Code Wrapper Gadget). What I really like about htmlcommentbox though is that you have control over who can leave comments. Do you want it open to the Public? Do you want people to be able to post anonymously? Do you want to approve comments before they go live? Need to have control over the ability to remove comments? htmlcommentbox gives you all that and much more. You don't need to use code to use htmlcommentbox. Just answer a few questions and the code is created for you to then copy and paste to your web page's html code area. Too caveats to htmlcommentbox. If you want to moderate comments you will need to associate your email address to the code. Not sure just how secure that is. Additionally, if you want to remove the plug for htmlcommentbox from your comment section it will cost you all of a $5 donation. If you're looking for a way to make comments happen easily on a page that doesn't allow comments; then, htmlcommentbox is for you. While honestly being left out in the cold may be just what those of us in Chicago need (heat index of around 105 today and even hotter tomorrow), you don't want to miss out on tonight's Web 2.0 utility. IcyVideo is another app that allows you to download YouTube videos. OK, big deal?! But, how many times have you wanted to download a friends video on Facebook or find something on Vimeo that you wish you could download? Yup, IcyVideo allows you to do that also, as well as videos from DailyMotion, Metacafe and Veoh. As always, remember to obey copyright and fair use laws. Tomorrow will be a double post. Tonight I got to see Blue Oyster Cult and quite frankly am way to tired to post about a utility. Where does the time go? It's Friday again? That means it's time to share yet another fun but educational site. Tonight I want to tell you about EdHeads. The activities at EdHeads are designed around various scenarios and are tied to lessons and standards. EdHeads is fun, addicting and educational. Currently, there are about a dozen challenging activities available. Ever have a need to share a number of links at once? Maybe for a presentation or for a webquest? You could build an email, wiki or just a basic html page. But that's a lot of work. Instead give MultiURL a try. You can add multiple links to one page that you can then provide a group name and even password protect your page. You complete your signup for MultiURL after building your first page and you can come back and re-share the link to the lists you create at any time.Additionally you get to see how many people have clicked the links within your page. There are some pretty interesting features and I haven't fully explored the possibilities with MultiURL, but I'm sensing that they are plentiful. Let me begin this post by saying, if I haven't gotten back to you regarding an email or a request for contact, I apologize. Life has this funny way of making one busy and not providing enough hours in the day to handle it all. This summer I had planned to complete the writing of a book on building Personal Learning Networks (PLNs), re-vitalize the Ustream show Webtopia.tv and get the Teacher Tech Academy open for business. Unfortunately, those projects took a backseat to my full time gig as a District Technology Coordinator (where we are not only rolling out Active Directory to replace Novell, but also upgrading most machines from XP to Windows 7 in the process. Not to mention I am working on an exciting project known as PBL4PD (Project Based Learning for Professional Development). After hours I continue to work on my Web 2.0 365 project blog, preparing presentations and workshops for IETC, FETC, ICE and hopefully NETA (I have heard great things about this conference), hopefully successfully completing my Google Certified Trainer application, serving on the volunteer committee for EdCamp Chicago and was recently honored to be invited to join SET Connections Board with some truly amazing and wonderful educators. And all that I just mentioned doesn't even begin to touch on my family and social obligations. My big problem is I can't stop having ideas! I really wish I could turn the brain off once in a while. So, again, if I have not responded to an email, tweet or social network invitation, I apologize. Don't think for a second that I forgot about you. But just in case, please do be persistent and send me a reminder! ...what would a collaborative space to share images and video be worth? We'll that's exactly what CanvasDropr provides. A relatively new application CanvasDropr allows you to drag and drop images to a canvas with others. You can also search for and and YouTube videos. CanvasDropr is similar to many ways to other lightboxes that are out there, but imagine the possibilities that come into play when the lightbox becomes a collaborative, real-time space. Would love to hear your opinions! I saw an interesting tweet from Vicki Davis today regarding a new tool that allows to permanently and legally license Creative Commons images. That tool is ImageStamper. Currently it only works with Flickr Creative Commons licensed images. And basically what it does is create a stamp (as the name suggests) proving that the license existed when you grabbed it. So even if the owner changes the license at a later date, you have proof that you obtained it under the license originally provided. A very interesting concept indeed. ImageStamper has some interesting potential. An amazing thing seems to happen with Google. They have so many features and extras that sometimes they disappear without notice. Such was the fate of Wonder Wheel this week. Wonder Wheel allowed you to do what I like to call tag cloud searching. You would perform a standard search and then turn on the wheel for some magic. Suddenly a tag cloud would appear around your search topic with related key words and the process would continue as you selected the key words. It was a real nice way to perform some deep dive searches. Who remembers writing position papers in high school and college. I do! I dreaded them. Who among my readers still assigns them? Well, if you do, tonight's post is for you (more specifically your students). aMap allows you to create a graphic flow chart based on informal logic which includes your Position (I think), Propositions (Because), Arguments (As) and Evidence (Supported By). You can have multiple "tails" coming off of your position. I wish I had something like aMap back when I was in school. Additionally, they have a service allowing you to create printed copies of your arguments for a fee. aMap is a pretty nice tool overall. Tonight's post will be short but sweet seeing as today is the 4th of July and I just got back from the Fireworks in town. Had I taken any pictures, I might want to edit them using tonight's application: SumoPaint. SumoPaint is as close as you're going to get to an online version of Photoshop that's free. There are layer options and filters. You can upload files from your desktop, url or from your SumoPaint account. So, if you have images that need a little touch up give SumoPaint a whirl. O.K., so the title was a stretch, but since I'll be telling you about myUdutu in tonight's post I thought it was creative. Before I get into the description though I wanted to touch on the writer's block I was having last night. Up until this point I have been trying my best to share Web 2.0 utilities I have actual real world experience with. I'm now struggling to find more. With this 365 project half done, I figured this may be the appropriate time to switch it up. So the second half of the year will be based on sites I don't have much experience with. We will learn together. Again, please be sure to share sites you would like to see reviewed here or if you would like to write a guest post for Zenodotus.net please contact me so we can work that out! Now, for the featured site of the night. myUdutu is a utility that I have seen in the past on my journey's through Cyberspace but never bothered to stop and look at until tonight. myUdutu is course authoring software that is completely hosted in the cloud. Supporting all types of media, myUdutu allows you to create presentations that become enagaging interactive online learning experiences. Creating these presentations seems easy enough. You are given a number of different templates to work with including basic screens, assessment screens, advanced screens, groups (to keep your content organized), scenarios and even an option for uploading powerpoints. Each format has a number of options and layouts available. I may have to use myUdutu to create the content for an upcoming project I have in the fall and report back once I have more experience with it. One caveat, online hosting is not free. You can offload the files in a zipped format and upload them to your own server. There is an option to save the projects at myUdutu for free if you don't mind the watermark. Otherwise they do have online subscription services starting at $19.95 a month. I do wish they had a cheaper option for educators. But as always, you get what you pay for and myUdutu looks like it holds value. I explained early in this 365 project that there would be times when I would share a repository of tools rather than the tool itself. Since I have a bit of writer's block tonight, this will be one of those posts. One of my favorite sites to peruse for Web 2.0 utilities is Listio. I just like how clean it is and the tagcloud design to search for related items. If you ever have a day to spend searching web 2.0 tools give Listio a try. I'm off to try rid myself of this blasted writer's block. As promised, Friday Fun Night will be a double post to make up for last weeks missed post. Let's start with a site called Academic Skill Builders. With games related to Math, Geography and Language Arts, Academic Skill Builders takes educational gaming to a different level. As a registered user you can track your progress. But more importantly Academic Skill Builders, takes a unique approach to educational gaming. These are standards based games. Yes, you read that right! And you can find out more about their pilot study here. In addition to tracking progress, you can customize gaming assignments and earn achievements. I highly recommend you visit this site to discover just how impressive gaming tied to standards can be.